Looking for some modern & chic tea party bridal shower invitations? Here you can find some cute tea party announcement ideas, brought to you by the best indie designers out there. 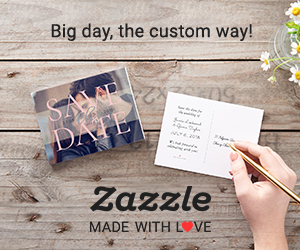 Every card can be easily personalized to suit your needs. Check out our handpicked selection of the most popular chalkboard style couple's shower invitations. All products are printed on both sides, in full-color, with many paper stock and size choices. Here you can find top 10 most popular "Mr & Mrs" Wedding Shower / Rehearsal Dinner Announcements. Easily add your photos and text to any of these designs & bulk order discounts apply! Below you find the top 20 nautical themed bridal shower announcements. Designed by talented indie artist, these invites will suit any maritime & sailing inspired type of event. Choose from 20 different paper types and sizes!